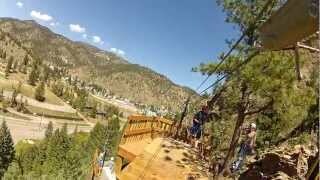 Our Cliffside Zipline course in Idaho Springs did it again! Colorado Zipline is taking home the trophy for the Best Adventure Park of the Rocky Mountains in 2018 by Elevation Outdoors. Join us on a zipline tour this year to help celebrate. 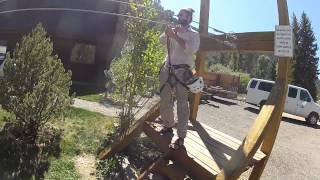 New to the concept of ziplining? While ziplines have been used as a method of transportation for over a century, modern day ziplining is typically recreational with ziplines and zipline courses offered to thrill seekers throughout the world. At its most basic, a zipline is a cable suspended between two points. 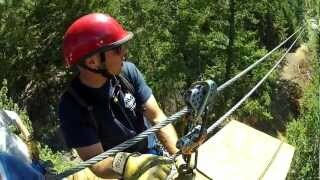 A pulley system is used to allow the participant to glide along the line smoothly and safely. Colorado is full of incredible aerial adventures that will have you soaring among the treetops near the peaks of the Rocky Mountains. 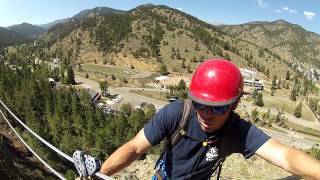 Wondering what some of the BEST zipline courses are in the state of Colorado? Zipline experiences can vary widely. From a single line close to the ground to multi-element courses strung through a natural setting, there are numerous options for all ages, experience levels, and desired excitement levels. Cables can be as short as 100 feet or as long as several thousand feet with varying degrees of steepness. The steeper the line, the faster you’ll end up traveling. While a single zipline is a great way to try out ziplining for the first time, a tour that includes several lines is a great option for families and groups looking to enjoy a guided experience. If you’re trying to figure out which tour is best for your party, ask questions about what the course involves, including how fast the lines are, how many lines you’ll get to zip, and any age or weight restrictions. 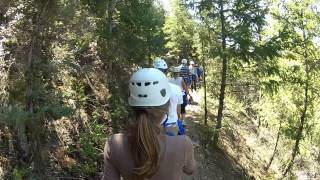 It’s also a good idea to ask what kind of environment you’ll be ziplining in (Forest? Mountain tops? Cliffs? Open fields?) and if there are any other aspects to the tour, like hiking to the starting point or additional aerial features you’ll get to experience. Ziplining involves some technical equipment, and most ziplines require assistance from trained staff to ensure a safe experience. Zipliners are typically outfitted with harness that connects them to the cable and pulley system. Some ziplines have additional structure around the harness while others have a freer, more open structure, allowing the participant to feel like they are experiencing flight. Speeds vary depending on the steepness and length of the line, as well as the weight of the individual. Braking at the end of the line also depends on the course. Some courses provide an automatic braking system in which the zipliner does not need to do anything. Other courses are more interactive and involve various braking methods. This allows the zipliner to go as fast or slow as they are comfortable going. The more interactive the course, the more training participants receive before venturing onto the course. If you’re looking to book a zipline tour, be sure to ask questions about what to expect on the course, including how long the entire experience will take and how involved you’ll be as the participant. What is the longest zipline in the world? In 2016, the Guinness Book of World Records named “the Monster”, at Toro Verde Adventure Park in Puerto Rico, as the world’s longest zipline. Riders reach speeds of up to 95 miles per hour as they travel 8,300 feet. 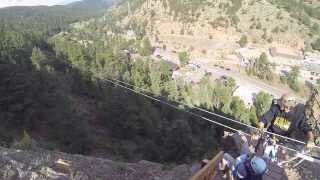 What is the steepest zipline in the world? Until recently, Zip Line Planica, in Slovenia, boasted the steepest zipline in the world, with an average incline of 38 degrees and maximum of almost 59 degrees. The Emilio Wilson Estate, on Sint Maarten, unveiled the Flying Dutchman in the summer of 2017, which it claims is the new steepest in the world at an average incline of almost 42 degrees. What is the fastest zipline in the world? The title for fastest zipline goes to Zip 2000 in South Africa, which has recorded speeds up to 114 mph. Zip World in Wales comes in a close second with the Zip World Velocity, which allows riders to experience “speeds well in excess of 100mph”. The line is so fast that when there are strong tailwinds, the staff may use mini parachutes to slow the rider down. What is the highest zipline in the world? La Tyrolienne has the honor of being the highest zipline in the world with a starting point at 10,597 feet of elevation. As an added bonus, it connects the ski resorts of Orelle and Van Thorens in the French Alps, allowing you to combine two downhill thrills in a single day. Haeakala Skyline Tour opened in 2002 and includes multiple aerial features in addition to its 5 ziplines. It also bills itself as Hawaii’s most awarded zipline company. 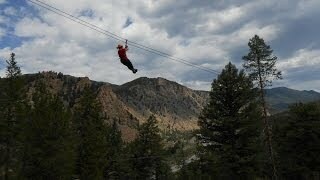 Colorado offers a wide variety of zipline tours across the state. Many of the ski resorts in the Rockies provide zipline options, and independent tour operators have further expanded the opportunities. And because of Colorado’s stunning natural scenery, your tour will probably come with a free upgrade of great views. 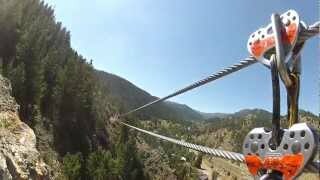 Chances are, if you’re staying in one of Colorado’s many top destinations, be it a resort town or a major city, there’s a zipline within easy driving distance. 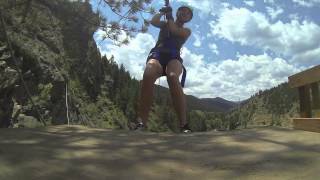 Because Colorado is a major destination for outdoor adventure, ziplines can often be packaged with other activities like whitewater rafting, rock climbing, horseback riding and more. Do your research before arriving at your destination – booking early often means better deals and more availability.